Customer relationship management software is aimed at improving client relationships. It helps you to manage relationships and interactions with both existing customers and prospective customers. CRM software allows you to streamline many aspects of your business, improve profitability and most importantly stay in touch with your customers. Teachworks client profiles come with standard fields to capture each client’s most important information. If you’d like to capture more detailed information you can expand profiles with our Custom Profile Fields Add-on. You can add as many additional fields as you need and the add-on supports several inputs, including checkboxes, radio buttons, text fields, text areas and more. Our Note & Communication Logs Add-on allows you to add detailed notes directly to client profiles. These notes are for internal use only and will never be visible to your clients. You can easily view profile notes in bulk by going to the Family or Student list in your Teachworks account and clicking on the “Profile Notes” link in the sidebar. Ensure that you don’t forget to follow up with clients by enabling our Follow Up Add-on. This handy feature allows you to add a follow up note and date to a student’s profile. To keep track of follow ups easily and efficiently, you can go to the family or student list to view the follow up dates and you can then follow up accordingly. Easily touch base with your clients with our Email Add-on. Recipients are grouped, making it really easy to email only students, only families or only teachers directly from your Teachworks account. Our Email Add-On is great for quick emails to your clients, but if you’d like to create beautiful email marketing campaigns and track performance, our MailChimp Integration is a great choice. With this add-on enabled, you can sync your Teachworks contacts to lists in MailChimp. Utilize their built in reporting features to track performance and identify areas that can be improved. Our Custom Enrollment Forms Add-On simplifies the enrollment process significantly. As soon as you’ve created a form, a URL will appear and you can easily embed this link somewhere on your website. 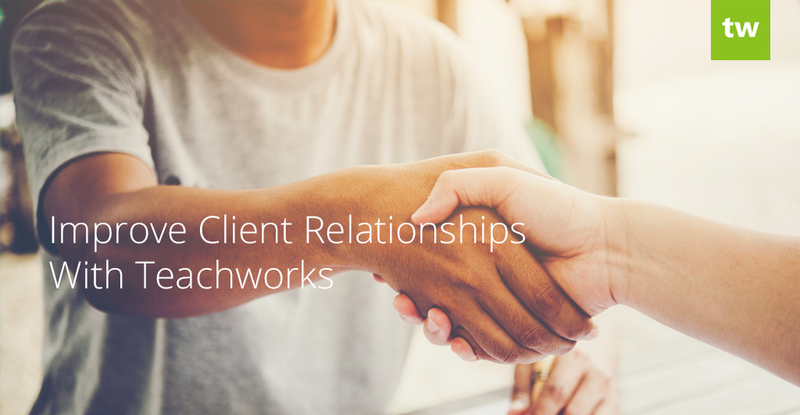 Potential clients can quickly sign up by completing all the required fields and based on this information, a Teachworks profile is created automatically. You can add more fields to the form by first adding Custom Profile Fields. « High Availability and Other New Updates!